Be the first to share your favorite memory, photo or story of LaVoris. This memorial page is dedicated for family, friends and future generations to celebrate the life of their loved one. LaVoris Foster went home with his Heavenly Father early Wednesday morning on January 16, 2019 at his residence in Rice, VA. He was born in New York City on November 3, 1983 to Jacqueline Foster and William Bolling Jr. He later moved to Blackstone, VA with his grandparents, William and Evelyn Bolling. LaVoris joined Springhill Baptist Church at an early age, and was an active member of the Sunday School and Junior Usher Board. He attended school in Nottoway County and graduated from Nottoway Senior High School in Nottoway, VA in June of 2001. 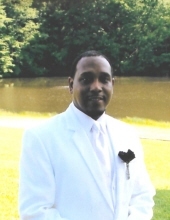 LaVoris worked various jobs, including Walmart, Piedmont Geriatric Hospital and Sun Chase Cinema 8 in Farmville, VA.
LaVoris always greeted you with a hug and a “Big Smile”. Whatever you did for him, he would always say “Thank you, I appreciate that”. Always a kind hearted, friendly person. He leaves to cherish his memories: a loving and devoted wife, Tiffany Brown Foster; a daughter whom he loved dearly, Shamyla Nicole Foster; mother, Jacqueline Foster of New York; father, William Bolling Jr. of Blackstone, VA; brothers, LaMar Foster of New York, Rashawn Patterson of Richmond, VA and Coby Branch of Blackstone, VA; sisters, Shanequa, Bredana and Lakita Patterson of Richmond, VA; grandparents, Annie Foster of Danville, VA, William and Evelyn Bolling of Blackstone, VA; mother and father-in-law, Cynthia Brown of Rice, VA and Eddie Brown of Prospect, VA; devoted sister-in-law, LaToya Brown; a great-great aunt, Mrs. Grace N. Jones of Blackstone, VA; a host of aunts, uncles, nieces, nephews, other relatives and friends. Funeral Services Tuesday, January 22, 2019 at 12:00 Noon at Springhill Baptist Church, Blackstone. Interment church cemetery. W.E. Hawkes & Son Funeral Home of Blackstone in charge of arrangements. To plant a tree in memory of LaVoris Foster, please visit our Tribute Store. "Email Address" would like to share the life celebration of LaVoris Foster. Click on the "link" to go to share a favorite memory or leave a condolence message for the family.